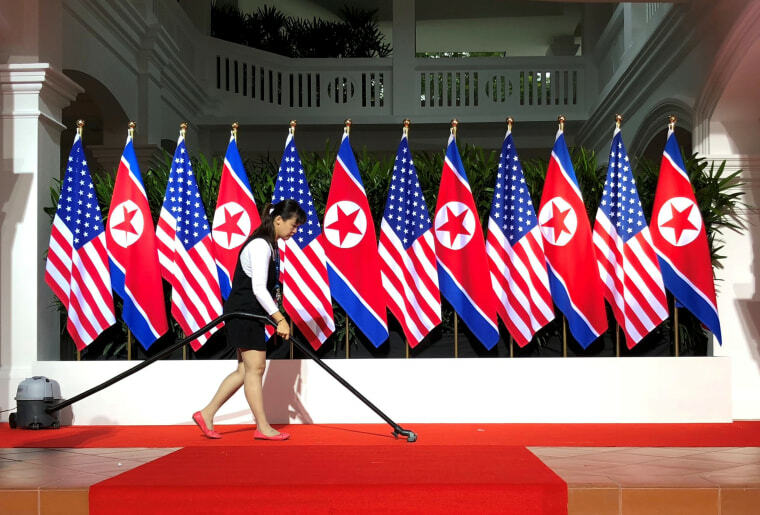 WASHINGTON — Last night’s summit between President Trump and North Korea’s Kim Jong Un was historic, it was a spectacle (those American and North Korean flags!) and it reduces — at least for now — the prospects for war, which seemed like a real possibility just months ago. But it also seems to fall short on substance. Indeed, the longer you focus on the signed agreement and Trump’s subsequent news conference, the less there is that meets the eye. 1. How does a “commitment” to denuclearization result in achieved denuclearization? “Chairman Kim and I just signed a joint statement in which he reaffirmed his unwavering commitment to complete denuclearization of the Korean peninsula. We also agreed to vigorous negotiations to implement the agreement as soon as possible,” Trump said at his news conference. But a commitment to denuclearization isn’t the same thing as achieved denuclearization. And as veteran diplomat Nicholas Burns asked on MSNBC’s “Morning Joe,” does Trump have the patience to carry out what would be a multi-year undertaking? 2. How will verification be achieved? The Iran nuclear deal — from which Trump withdrew — had A LOT more specifics about verification than what Trump said above. 3. What’s the timetable for denuclearization? 4. Did Trump give up more than he received from North Korea? North Korea’s Kim got legitimacy, kind words from an American president (“He is very talented”) and a freeze on U.S.-South Korean military exercises. What did Trump and the United States get in return — except for a commitment to denuclearization? A question to ponder: What would the Republican Party have said if Barack Obama made this same deal and held the same meeting with North Korea’s dictator? How would they have reacted? 1. Will another sitting GOP member of Congress get forced into a runoff — or lose — for being disloyal to Trump? Last week, Rep. Martha Roby, R-Ala., got forced into a runoff due in part to her opposition to Trump in 2016. Will Rep. Mark Sanford, R-.S.C., meet the same fate today? Or worse? He’s getting a primary challenge from state Rep. Katie Arrington, who has campaigned against Sanford for being disloyal to Trump. A candidate needs to surpass 50 percent to avoid a June 26 runoff, and it also will be interesting to see if GOP Gov. Henry McMaster gets above 50 percent. 2. Who comes out on top in the Democratic primary for Nevada governor — Harry Reid’s candidate? Or the candidate backed by EMILY’s List and Hillary Clinton? Republican Gov. Brian Sandoval is term limited, and the Democrats who are running to replace him are Clark County Commission Chair Steve Sisolak (who’s endorsed by Harry Reid) and Clark County Commissioner Chris Giunchigliani (who’s backed by EMILY’s List and Hillary Clinton). The frontrunner on the GOP side is state Attorney General Adam Laxalt. 3. How does Maine’s ranked-choice balloting fare? And how long does it take to get a winner? The marquee contests in Maine are the Dem and GOP fields vying to replace term-limited Republican Paul LePage. But there’s an interesting twist to these primaries: Maine is using ranked-choice balloting to determine who wins, and here’s how that system works: “[A] winner is only declared if a majority picks a candidate as their first choice. If not, the candidate with the lowest number of first-place votes is eliminated and second-place votes for that candidate are reallocated. The process is repeated until someone wins a majority,” the Bangor Daily News writes. And we might not know the winner for a few days – if not an entire week. 4. Which Virginia Republican faces Tim Kaine in November? Is it Corey Stewart or EW Jackson? Controversial Corey Stewart (who campaigned on Confederate monuments in 2017), controversial EW Jackson (who was the Republican nominee for Lt. Gov. in 2013) and state Rep. Nick Freitas are competing in the GOP race for the opportunity to challenge Sen. Tim Kaine, D-Va.
5. And which Democrat becomes the nominee to face Rep. Barbara Comstock in VA-10? In the Dem race to take on Rep. Barbara Comstock, R-Va. — one of the most vulnerable GOP incumbents this cycle — the top candidates are state Sen. Jennifer Wexton, former state Department official Alison Friedman and Iraq/Afghanistan war vet Dan Helmer. As one of us wrote yesterday, Latinos and young voters aren’t expressing much interest in the upcoming midterms — at least compared with other groups, according to the latest NBC/WSJ poll. But the same could be said of Republican voters in general. Judging from past midterm turnouts, who would have guessed that GOP men and women would be lagging in enthusiasm compared with Democratic men and women? By the way, the enthusiasm difference between whites with college degrees (61 percent) and whites without (48 percent) is striking – given the political realignment with these groups.